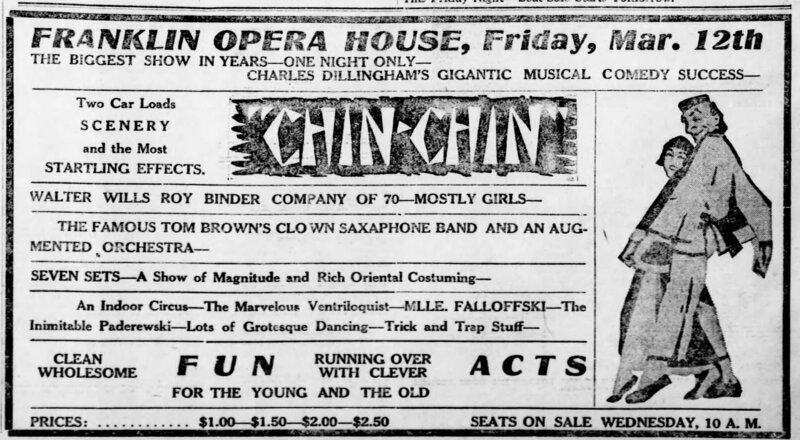 “Chin Chin” came to the Franklin Opera House for a show on March 12th, 1920. It had played at the Lyceum Theater in Rochester, NY, sometime during the week of March 5th. I am not sure where the show was during the week between Rochester, NY, and Franklin, PA.
Preshow advertising begins with a standard “Chin Chin” ad and a photo of the famous Tom Brown clown band, three days before the show. [i] Additional ads ran on the 10th and the 11th. Finally, on show day (March 12) there were several ads and illustrations printed in the paper[ii] – Page 2 had a photo showing key cast members and page 7 had a normal ad. The Franklin Opera House is the second building from left (with 2nd-floor awnings. SOURCE: Facebook-Venango County Historical Society – GAR Parade – Franklin, PA – Aug 1887. 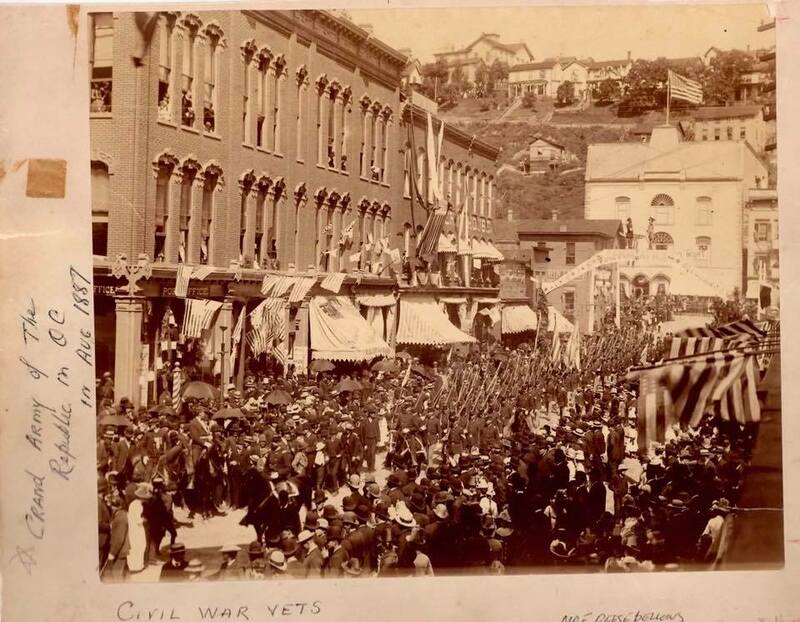 I have not been able to find a good, clear photo of the theater, however, the photo of the Grand Army of the Republic in Aug 1887 parading does show the theater. In that photo, the building on the left is the town hall, next to it is a building with awnings on the second-floor windows. Looking closely, you can see it says “Opera House” across the building. Today, the site is the location of the Franklin City Hall. [iv] The Cahn-Leighton official theatrical guide. (1913). New York, N.Y: Publication Office, New Amsterdam Theatre Building. [vi] See Endnote i above. [vii] See Endnote iii above.